Disasters are not uncommon events, and take many forms. Natural disasters include weather phenomena, such as hurricanes, tropical storms, winds, floods, extremes of heat or cold, earthquakes, landslides, and volcanic eruptions. Manmade disasters generally include building collapse, transportation accidents, and industrial accidents and now include acts of terrorism, genocide, and war. Although disasters primarily are seen as sudden onsets of cataclysmic events, such as a tsunami, there are ‘slow-onset’ disasters, such as drought, famine, or environmental hazards, which occur over a longer duration of time. Disasters, in whatever form they take, rob us of our sense of well-being, our security, our community, our loved ones, and our homes. Disasters forever change ‘life as we know it’ and seriously impact our ability to function. We may rebuild buildings and replace lost books but the impact on staff, their families and loved ones, and their communities linger. With the hurricanes -- Ivan, Dennis, and Katrina -- and now the earthquakes in Haiti and Chile, we are increasingly vulnerable to the forces of nature, which we cannot control. However, we can inform ourselves of best practices through the experiences of others and through the research. It is to this that the theme of the 2011 ACURIL Conference was chosen. The 41st conference will consist of keynote speakers, formal presentations, panels, workshops, and poster sessions to address real concerns in our response to disasters that occur in our libraries, our role in the community before and after a disaster, and our role in helping to build the evidence base in disaster research to make our communities safer and more resilient to catastrophes. The first day will be devoted to how we in libraries and archives respond to the disasters that befall us. This day will focus on management and triage, not only of books and media but will also the human side of libraries and archives, our staff. The second day will be devoted to how archives and libraries respond within our communities before and after disasters occur. For example, what types of outreach can we provide? How do we recreate our services to meet the needs of our patrons? The third day will examine the roles of libraries and archives in disaster research. 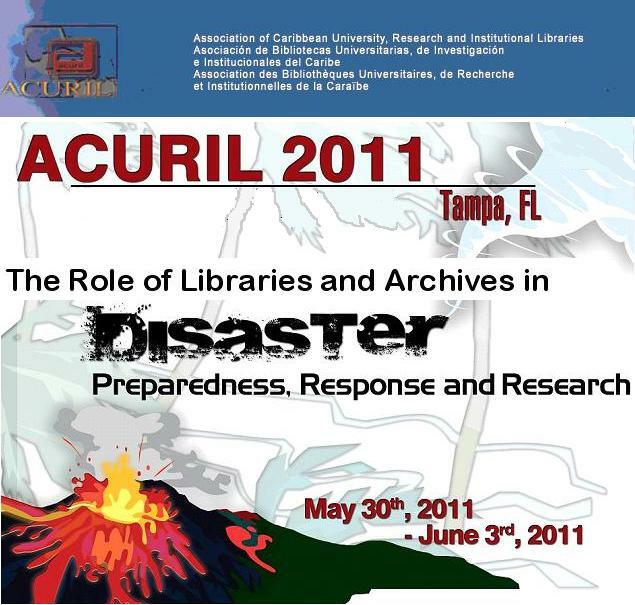 Libraries, such as Caribbean Disaster Information Network (CARDIN) and the Regional Disaster Information Center for Latin America and the Caribbean (CRID), address a broad spectrum of topics in disaster research. There are also collections who specialize in a focal area, for example, the Florida Mental Health Institute Research Library's collection on disaster mental health collection or the Natural Hazards Research Center's collection on post-disaster assessment and analysis, or the University of Delaware Disaster Research Center, which houses one of the largest social and behavioral sciences disaster collections.